Bengaluru: Residential land prices in Bengaluru are set to go north with an increase in guidance value taking effect on Thursday. The second revision in 15 months has seen guidance value in some prime areas touch Rs 20,000sqft. The hike in guidance value - the minimum valuation at which properties have to be registered - ranges between 5% and 30% across the city. Guidance value deter mines stamp duty and other charges to be paid during registration. 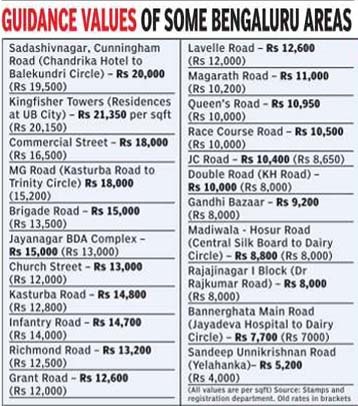 Sadashivnagar is the most expensive locality in Bengaluru, followed by Malleswaram and Cunningham Road, according to the official rates announced on Thursday. Realty experts point out that the market value of properties on the top end is Rs 33,000sqft to Rs 35,000 sqft. Apartments in Kingfisher Towers (the homes at UB City) continue to hold the record of being the most expensive residential properties, with guidance value hovering between Rs 20,250sqft and Rs 21,350sqft. Guidance value in 90% of Sadashivnagar is Rs 20,000. The lowest guidance value in the locality, said to be home to the first-generation rich postindependence, is Rs 15,000. Palace Orchards -a premium residential locality stretching between Cavuery Theatre and Bashyam Circle in Sadashivnagar -has the second highest guidance value: Rs 20,000sqft. While flat prices tou ched the Rs 20,000 per sqft mark officially last year, it's the first time price of land for residences has hit the Rs 20,000 mark, according to information provided by Bhojya Naik, deputy inspector general, stamps and regis tration department. Guidance value on all arterial streets in CBD has been hiked between 5% and 15%.Kasturba Road recorded the highest hike of 14%. The value on MG Road stretch from Kasturba Road to Trinity Circle and Commercial Street has gone up by 10% and 8%. Bengaluru: Realty prices in Bengaluru are set to go north with the state government on Thursday hiking the guidance value -the minimum valuation at which properties have to be registered -by up to 30%. This makes registering properties more expensive since the guidance value is the base rate for fixing stamp duty and other charges. Guidance values were last revised in August 2013 and this revision comes amid government assertions that it'll be an annual affair. The value has been hiked across the state. "We have increased the guidance value by an average of 10-12% across the state in our attempt to bridge the gap between market value and guidance value,'' said N Prakash, inspector-general of registration and commissioner of stamps. Finance department sources said the hike was inevitable as revenue from stamp duties had seen a slump of 10-15% this year. Following the revision, the revenue department expects to meet the target of Rs 6,800 crore in the next four months, they added. The government saw a good opportunity to increase the guidance value and check its dwindling revenue since the real estate market was booming, sources said. "Though the revision will bring more revenue to the exchequer, our main aim was to check the black money component in property transactions. Actual transactions often take place much above the government's prescribed rates (guidance value)," he added. While guidance values have been increased across the board by average 10-50% across Karnataka twice in the past 15 months, officials contend they're still lower than the prevailing market rates. The realty sector fears an increase in guidance value will reduce transactions in Bengaluru. "This is not good either for the industry or homebuyers. Instead of in creasing guidance value randomly , the government should look to conduct a scientific study of rates through an outside agency with inputs from both government and developers. Such a study will give a fair amount of fixing guidance values, " Suresh Hari, secretary , CREDAI Bangalore. Farook Mahmood, chairman & managing director, Silverline Group, said frequent increase in guidance value is not good as it creates unnecessary price hike and ultimately burdens the buyer who is already coping with VAT and service tax, among others. "We've also found that in many locations the actual values are much lower than the proposed new guidance values, " he added.